The Hill Street Beauty is a quintessential historic mill cottage built during the time of Bend’s mill heyday, and has been lovingly restored with all of the modern amenities and historic turn-of-the-century charm wonderfully preserved. Lava rock gardens and a private outdoor hot tub make for enchanting evenings and outdoor living. Cruiser bikes are provided. Your furry dog friends are welcome too! So many delightful surprises await you in this historic cottage! Charming and sunny with plenty of windows, gorgeous hardwood floors, comfortable furnishings and upscale decor. Cozy up with a good book, watch a movie, enjoy free high-speed internet, or play games with family and friends. Kids will love the loft! Join in on our traveler's game of "shot glass exchange" and enjoy our living collection of shot glasses from all over. Take one home as a souvenir and leave one from your home town in its place. Prepare an unforgettable meal in the fully equipped gourmet kitchen newly updated with modern appliances. Sit-down dining for 4, with 2 additional counter stools ensure many lasting memories to be made. Enjoy outdoor living Bend-style! Grill out on the back deck while you enjoy the fabulous lava rock gardens in your own private hot tub under a Central Oregon sky filled with stars. The key to a fantastic vacation is a good night’s sleep! Enjoy gorgeous European style bedding with high thread count linens and down duvets. The front bedroom has a King sized bed, and there is a Queen in the second bedroom. There is a high quality Queen sized futon and linens provided in the upstairs loft. Outstanding location as a home base to explore Bend. This is a nice little home. Very comfortable and well appointed for our stay. Nice neighborhood, without much traffic. Generally quiet and definitely felt safe there. Easy walk to downtown with a great assortment of coffee shops, restaurants, bars, breweries. Great grocery store only a few blocks away too. We walked early and late, it was always easy to access whatever we were looking for. I would highly recommend for a couple or 4-some. This house is great! Wonderful location and true "home away from home". The attic space was great for our child to play in and relax. The kitchen was great stocked with local coffee; a real value in Bend and our "home away from home! Great place to stay in Bend. Clean, well-stocked, tastefully decorated with comfy beds! Great backyard and very walkable. Nice place in a residential area. Close to a really nice market. We enjoyed our stay there. The host was incredible kind, helpful and responsive! 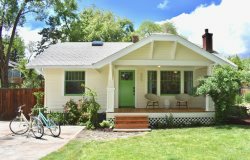 The home is located very close to downtown Bend and is within walking distance from a lot of restaurants, parks, coffee shops and shopping. Also, the kitchen stove is amazing! If you like to cook you wont be disappointed! perfect place to stay to explore downtown bend and explore outside the city. everything was clean, well kept and cozy. will be coming back on our next trip to bend! Thank you Bluebird Day for the great service and beautiful little house. The Hill Street Beauty is in a prime location in downtown Bend. I loved staying here. I had some work to do, and was able to work most of the day in this quiet, and comfortable space, and then take advantage of the restaurants and shops in the evenings. Within walking distance of the great brewery, Crux, as well as a beautiful market, Market of Choice. Then the theater at McMenamins is wonderful. Better than expected! We chose the house due to its location with reference to the breweries in town. We were pleasantly surprised and think the pictures online didnt do the place justice. The kitchen was perfect size, nice TVs for watching college football, the beds were amazing, Comfortable and cozy. The back yard deck was just the right size for the 4 of us. Best of all was how centrally located it was to most of the good breweries and restaurants. Easy walk to anywhere and when in town to check out the amazing beer walking is the way to do it. Clean, comfortable, the staff I spoke with were super nice and accommodating. Id recommend in a heartbeat. If you want to experience Downtown Bend at its absolute best, book this house. The location was perfect for a short walk or an even quicker bike ride (stored in the garage!) to all the best that Bend has to offer -- including more than just a few breweries. The house is full of charm and the hosts have not missed a single detail in terms of planning for a guests comfort. In addition, Bluebird Day is very thoughtful with their communication and very friendly. We called earlier in the day and asked if we could check in early and they were very accommodating. If we come back to Bend (and we will), well definitely book again. This is a lovely house and very well equipped. The master bed is sooo comfortable! We had our 2 dogs with us and were delighted to find that the back yard was totally fenced. Great location. Easy check in and great communication from the host. Would recommend to anyone looking to enjoy Bend. We had a great time. The house was furnished beautifully and very comfortable. Loved this rental - clean, comfortable beds, good location, lovely landscaping including the back lava rock garden, well stocked kitchen, Internet and cable (watched some Olympics! ), and 4 brand new cruiser bikes with helmets to boot! So accommodating for 4 adults. Loved everything - comfortable beds, clean, great location, all amenities, including the awesome brand new cruiser bikes! Also loved the back patio and beautiful landscaping. Host checked in prior to our arrival and again once we arrived to make sure all was well. Neighborhood was conveniently located near town in a quiet neighborhood. House was clean and adorable. The house was cozy, clean, and very well situated close to all amenities and shopping. We were 3 kids and parents and the house was really just perfect for our stay. Check in was very smooth and all communications and instructions smooth and timely. Would definitely stay here again! This was a fantastic find! Location is perfect - house is well equipped, nicely decorated and super clean, with a great backyard. Parking and dog friendly made it perfect. We enjoyed our trip - thank you! Well-maintained and cozy house. Good amenities. Comfortable beds. This was a great place to stay. Great stay! The house exceeded our expectations. Great neighborhood, centrally located and able to walk to everything. Well appointed an comfortable. Accommodated six of us no problem. Would definitely recommend and would stay here again. Thanks for sharing your home!